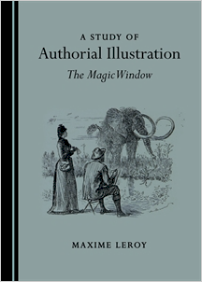 Maxime Leroy, A Study of Authorial Illustration: The Magic Window, Cambridge Scholars Publishing, 2019, 109 p.
This book analyses the practice of illustrating one’s own works of literature. The first part discusses theoretical aspects of authorial illustration and suggests some critical approaches to it. In particular, it considers the use of systemics as an actionable framework for its study. The second part consists of commentaries on specific illustrations. The book adopts a conversational style, providing academics and students in literature and the fine arts with an enjoyable, scholarly introduction to this thriving field of research. Maxime Leroy is a Senior Lecturer in English Studies at the Université de Haute-Alsace, France. His doctoral thesis focused on authorial prefaces, from Walter Scott to Joseph Conrad. His research examines the status and significance of authorial paratexts such as prefaces and illustrations in Victorian and Edwardian fiction.